One of the MOST important things we're gonna have to do to get the Holiday back into Holiday Hollow is get that magic tree grown back up to be the centrepiece of the Town in it's festivities! 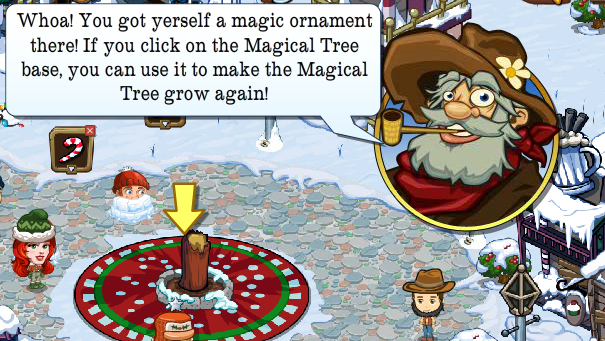 Thankfully, even though Buck cut the old tree down that's no block to the festive magic! Every time you complete a mission you'll find yerself picking up a Magic Ornament that's got somethin' in common with that there mission you completed. Once you pop them on the magic tree, it'll grow itself back up to the magnificent spectacle it is every year, standin' in the middle of our Town to warm the hearts of everyone. 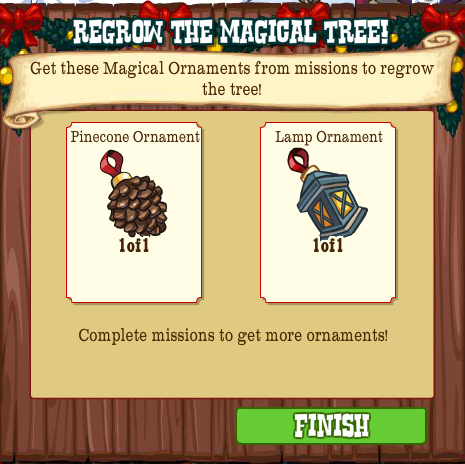 Once that tree be up and sparklin' Lady Edwina won't be able to NOT feel the festive spirit.